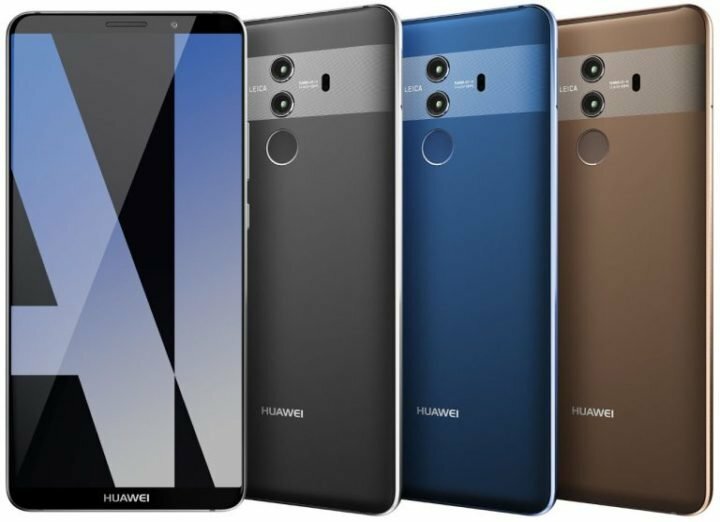 Huawei already confirmed that it will unveil the Mate 10 and Mate 10 Pro with Kirin 970 and full-screen display offering high screen-to-body ratio at an event in Germany on October 16. Evan Blass aka @evleaks already posted the specifications of the Mate 10 Pro code-named ‘Blanc’ revealing that it will have a water-resistant body, Android 8.0 (Oreo) and f/1.6 aperture rear camera. Now he has shared the first press shot of the smartphone in Black, Blue and Brown colors. A close-up shot also reveals LEICA SUMMILUX-H 1:1.6/27 ASPH cameras with laser auto focus on the back. Huawei will also introduce another smartphone code-named ‘Alps’ with a 5.88-inch Quad HD 16:9 screen, Kirin 970, 4GB RAM, 8.23mm thick body and a 4000mAh battery. It will also introduce the Mate 10 Lite that was launched in China as Maimang 6 recently.